The United States as we know it today is largely the result of mechanical inventions, and in particular of agricultural machinery and the railroad. One transformed millions of acres of uncultivated land into fertile farms, while the other furnished the transportation which carried the crops to distant markets. Before these inventions appeared, it is true, Americans had crossed the Alleghenies, reached the Mississippi Valley, and had even penetrated to the Pacific coast; thus in a thousand years or so the United States might conceivably have become a far-reaching, straggling, loosely jointed Roman Empire, depending entirely upon its oceans, internal watercourses, and imperial highways for such economic and political integrity as it might achieve. But the great miracle of the nineteenth century — the building of a new nation, reaching more than three thousand miles from sea to sea, giving sustenance to more than one hundred million free people, and diffusing among them the necessities and comforts of civilization to a greater extent than the world had ever known before is explained by the development of harvesting machinery and of the railroad. The railroad is sprung from the application of two fundamental ideas — one was the use of a mechanical means of developing speed, the other, the use of a smooth running surface to diminish friction. Though these two principles are today combined, they were originally absolutely distinct. 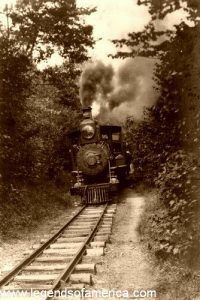 In fact, there were railroads long before there were steam engines or locomotives. If we seek the real predecessor of the modern railroad track, we must go back three hundred years to the wooden rails on which were drawn the little cars used in English collieries to carry the coal from the mines to tidewater. The natural history of this invention is clear enough. The driving of large coal wagons along the public highway made deep ruts in the road, and some ingenious person began repairing the damage by laying wooden planks in the furrows. The coal wagons drove over this crude roadbed so successfully that certain proprietors started constructing special planked roadways from the mines to the river mouth. Logs, forming what we now call “ties,” were placed crosswise at intervals of three or four feet, and upon these supports thin “rails,” likewise of wood, were laid lengthwise. 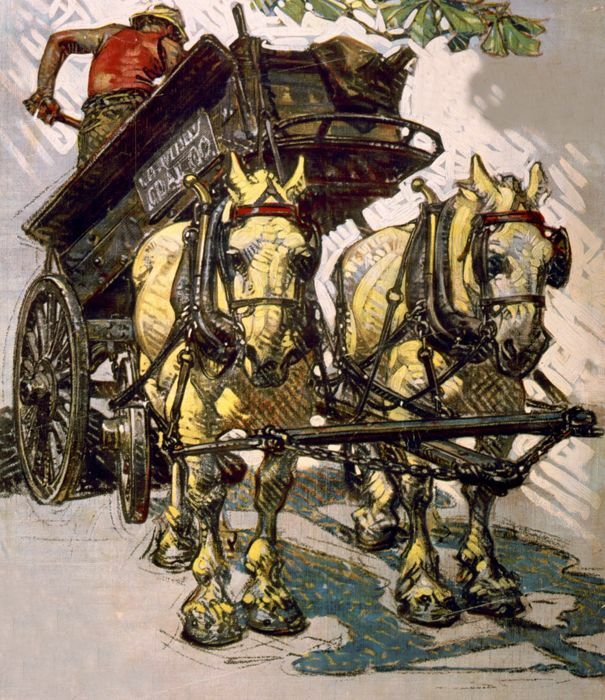 So effectually did this arrangement reduce friction that a single horse could now draw a great wagon filled with coal — an operation which two or three teams, lunging over muddy roads, formerly had great difficulty in performing. In order to lengthen the life of the road, a thin sheeting of iron was presently laid upon the wooden rail. The next improvement was an attempt to increase the durability of the wagons by making the wheels of iron. It was not, however, until 1767, when the first rails were cast entirely of iron with a flange at one side to keep the wheel steadily in place, that the modern roadbed in all its fundamental principles made its appearance. This, be it observed, was only two years after Watt had patented his first steam engine, and it was nearly fifty years before Stephenson built his first locomotive. The railroad originally was as completely dissociated from steam propulsion as was the ship. Just as vessels had existed for ages before the introduction of mechanical power, so the railroad had been a familiar sight in the mining districts of England for at least two centuries before the invention of Watt really gave it wings and turned it to wider uses. In this respect, the progress of the railroad resembles that of the automobile, which had existed in crude form long before the invention of the gasoline engine made it practically useful. In the United States, three new methods of transportation made their appearance at almost the same time — the steamboat, the canal boat, and the rail car. Of all three, the last was the slowest in attaining popularity. As early as 1812 John Stevens, of Hoboken, aroused much interest and more amused hostility by advocating the building of a railroad, instead of a canal, across New York State from the Hudson River to Lake Erie, and for several years this indefatigable spirit journeyed from town to town and from State to State, in a fruitless effort to push his favorite scheme. 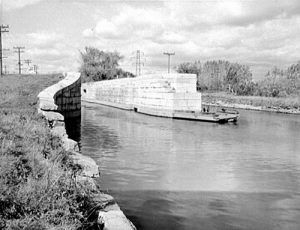 The great success of the Erie Canal was finally hailed as a conclusive argument against all the ridiculous claims made in favor of the railroad and precipitated a canal mania which spread all over the country. It was a simple matter to find fault with the railroad; it has always been its fate to arouse the opposition of the farmers. This hostility appeared early and was based largely upon grounds that have a familiar sound even today. The railroad, they said, was a natural monopoly; no private citizen could hope ever to own one; it was thus a kind of monster which, if encouraged, would override all popular rights. From this economic criticism, the enemies of the railroad passed to details of construction: the rails would be washed out by rains; they could be destroyed by mischievous people; they would snap under the cold of winter or be buried under the snow for a considerable period, thus stopping all communication. The champions of artificial waterways would point in contrast to the beautiful packet boats on the Erie Canal, with their fine sleeping rooms, their restaurants, their spacious decks on which the fine ladies and gentlemen congregated every warm summer day, and would insist that such kind of travel was far more comfortable than it could ever be on railroads. To all these pleas the advocates of the railroad had one unassailable argument–its infinitely greater speed. After all, it took a towboat three or four days to go from Albany to Buffalo, and the time was not far distant, they argued, when a railroad would make the same trip in less than a day. Indeed, our forefathers made one curious mistake: they predicted a speed for the railroad a hundred miles an hour — which it has never attained consistently with safety.